I live in southern Oregon and have a real problem with hornet nests in old downed logs and stumps. Everyone calls them “meat bees”. If there is a critter carcass or just trying to eat a hamburger outside in the yard they come. Disturb one of the stumps or logs and you get a cloud of the angry little suckers with a target on you. I’ve tried many different ways to eliminate them to no prevail but the results were only temporary. Problem is they’re all over the place. Their very aggressive. I’ve been stung over a dozen times in one attack. Do you have any sure fire remedies excluding fire? This other way is to use a bait. In fact we have a special concentrate that is composed of tiny microscopic capsules which contain an active chemical inside. These capsules are in a liquid form and this liquid is mostly used as a general spray around the home. You can’t tell its made of these capsules; they’re too small to see. What you do see is what appears to be just another liquid concentrate. And when its mixed with water and sprayed around the home, it will slowly release the active ingredient which in turn will kill unwanted pests that travel over treated areas. 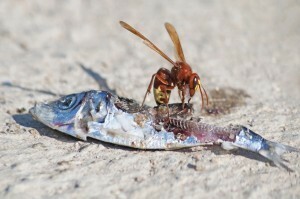 This same chemical can be mixed with food and then the mixture can be used as bait to target meat bees. Basically if you place the bait out where they can find it, they’ll feed on the offering, bring it back to their nest, feed it to the other members of their colony including their young and then when the capsules enter their digestive system, they will break open, release the active ingredient and in turn, kill the entire nest. The process will usually take 4-6 days to run its course but its a sure fire method allowing you to get rid of all meat bee activity on your property without ever having to know where the nest is located. To set up the bait, you’ll need ONSLAUGHT. This material comes in liquid form and you’ll need to mix 1/2 oz with 8 oz of bait. We have found our SALMON PASTE works well on meat bees but in some cases, they prefer a sweet food. So if you have bees targeting sweet food, our sugar based LOGANBERRY PASTE will do the job. Add 1/2 oz to 8 oz of our Salmon Paste for meat feeding bees or wasps. For sweet food feeding bees or wasps, get the Loganberry paste. To insure non-target animals like kids and pets don’t get the bait, use our tamperproof INSECT BAIT STATION. These can be mounted up high on a tree or the side of your home. 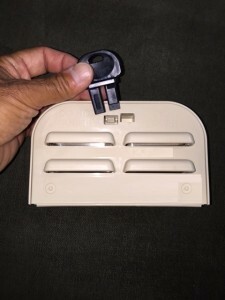 You’ll need at least one station with the special “key” to open it. 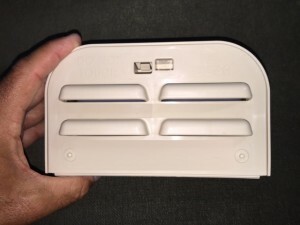 The front “door” will pull down and inside you will find two bait “trays” used to hold the mixture of sweet or protein based bait. If you want to set out more than one station, get extra “stations only”. In general, placements will be found and fed upon by one nest and within a week, that nest will be killed. But its common to have new nests in the region find the offering so be prepared to refill the station every 5-10 days as needed. In general, its best to watch the stations daily to monitor activity. When the activity decreases or stops, inspect the station to make sure there is still some bait left. If the trays are mostly empty, rinse them out and make a new bait placement. Great! I’m placing a order and will fill you in on how it goes. Thanks.. Sorry for the delay of getting back on the results. I received the bait boxes, bait, and Onslaught in a timely manner. After baiting the boxes with the salmon paste mixed with Onslaught, I placed them throughout my 20 acres. Every other day, after dark, I mixed a little fresh paste with what was still in the tray. A week later not a single meat bee (hornet)! Even my neighbors said they noticed a lack of them. All in all, I’d say that the bait boxes, paste, and Onslaught is a Home Run. And definitely a main stay in my regiment of Pest Control. Well it’s a new summer and I’ve been waiting to see if any Meat Bees (hornets) come back. I didn’t load the bait boxes with the salmon paste and Onslaught to see if in fact any do come back at all. It’s been a month and not a single one. 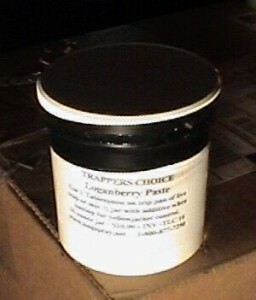 I ordered the Loganberry paste to bait the boxes with something sweet along with the salmon paste this year. I received he Loganberry paste, boy was it stiff and thick. I had to use a flat blade screw driver and some water to break it down enough to mix in the Onslaught. No real problem. just a little exercise. My neighbors had called and said ” That stuff you put out last year, really works” And they asked me to set up boxes on their property as well this year. If you have Meat Bees (hornets) these products combined work fast and completely. Without a lot of hassle or chasing them down year to year. Place the bait boxes, and they will come !!! As for the Loganberry being “thick”; this is by design. The best way to think of it is to think about the consistency of Maple Syrup vs Raw Bee Honey one can purchase still in the comb. If you look at the label of natural Maple Syrup, you’ll see it says you “need to refrigerate” after opening else it will go bad. Raw Honey is notably thicker yet it never goes bad with no refrigeration needed. Loganberry paste is much the same; you don’t need to refrigerate it as it will keep for several years at room temperature. In order to meet that standard, we have to add stabilizers which cause it to thicken up. But this consistency won’t affect its taste so if there are any sugar hunting bees around, they’ll find it. Well here we are, the third year after starting the treatments with Onslaught. Usually by this time of the year, from the cool days and cold nights to hot days and mild nights the meat bees come out in full force during the day looking for a food source. As of yet, not a single sighting reported! This covers an area of 180+ acres. Adding the Loganberry mix to the equation has drastically reduced the numbers of wasps. I imagine after another year of treating for them as well there won’t be many surprises opening something and having a swarm of them to greet you. Thank you folks at Bugspray.com, I refer you every chance I get.